In an article about events on the other side of the planet: Show a map of countries and main places that the article mentions, in case readers are not familiar with them. In an article in a local newspaper: Show a map of locations within a few blocks in a city, e.g. concert locations. In a travel article: Show a map of the main sights in a city or country. To create a locator map, go to datawrapper.de and click on "New Map" and then "Locator map". 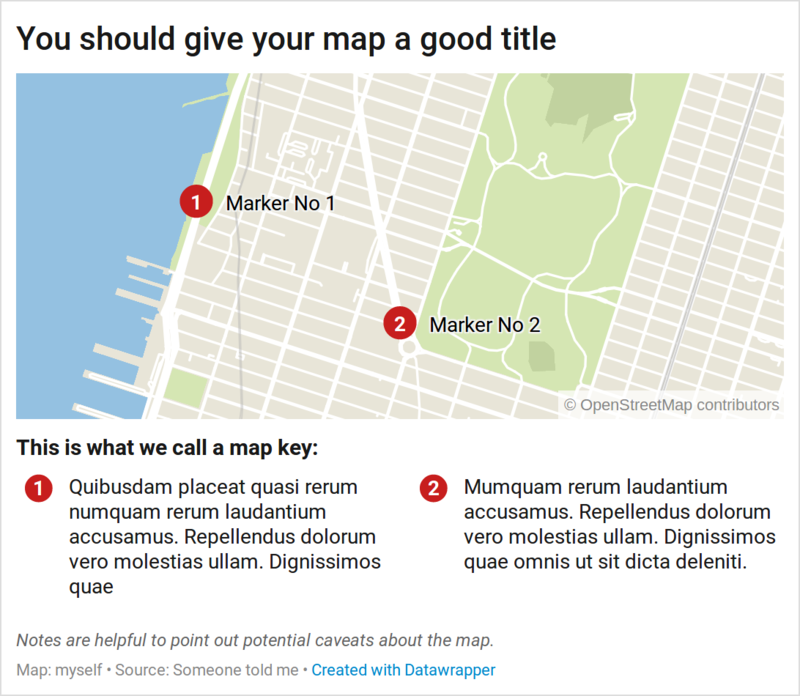 This will open the locator map creation pipeline. Four steps will lead you to your result: 1: Add markers, 2: Design map, 3: Annotate and 4: Publish. While you're adding markers you will also start to adjust the map view. You can pan and zoom the view, but also rotate and even tilt the view angle. This is something you can do in all three steps. In this step you can change how the map under your markers looks like. We offer four different map styles and you can toggle individual layers on or off (e.g. roads or water). We also offer four extras that you can add to your map: a scale bar, a north arrow, a inset map, and a a highlight region. 👉 Read more about how to how to annotate your locator map.